Stopping moving parts in target positions and locking them into place is a common requirement for plant and machinery engineers. Their favoured method for doing this is often the index plunger, with the cam operated version being particularly popular. Engineering components manufacturer WDS Component Parts Ltd. offers a wide range of index plungers and is a leading authority on the technology. Conveyors are often fitted with diverter gates which are positioned to direct the flow of parts in a given direction. Many machines have an inspection hatch or other shutters that needs to be locked into position for safety. Assembly and packing stations may need to be able to lock major components into a precise place so that a robot arm or other automated mechanism can accurately fit other parts to them. In all of the above examples – and many other similar applications – an index plunger is the preferred method of positioning, particularly if parts need to be held firmly, positioned accurately or locked into place. There are many types of index plungers, including spring-loaded, screw-action and push-type, with cam-operated plungers being noted for their ease of operation. Like all index plungers, cam action plungers have two operating positions, extended and retracted. The cam mechanism makes the selection of either precision position a simple one-touch operation, rotating the handle or lever through 180 degrees. In operation the lever glides smoothly along a cam track machined into the top of the body of the indexer to retract or extend the pin. A spring is usually incorporated into the plunger to hold the lever against the cam track with a specific force as the lever is rotated. A small groove in the cam allows the lever to be held in exactly the fully retracted position with a slight locking effect. The groove also acts as a visual reference to indicate the fully retracted position and can be seen as a safety feature in some applications. WDS can supply cam action indexing plungers in a wide range of sizes and variants. For instance they can be made of steel, stainless steel or aluminium and with extension lengths from 38 mm to 57mm. They usually have a threaded outer casing for easy mounting and come fitted with two lock nuts and a plastic lever grip. A matching range of mounting blocks is also available, which facilitate both vertical and horizontal plunger mounting. 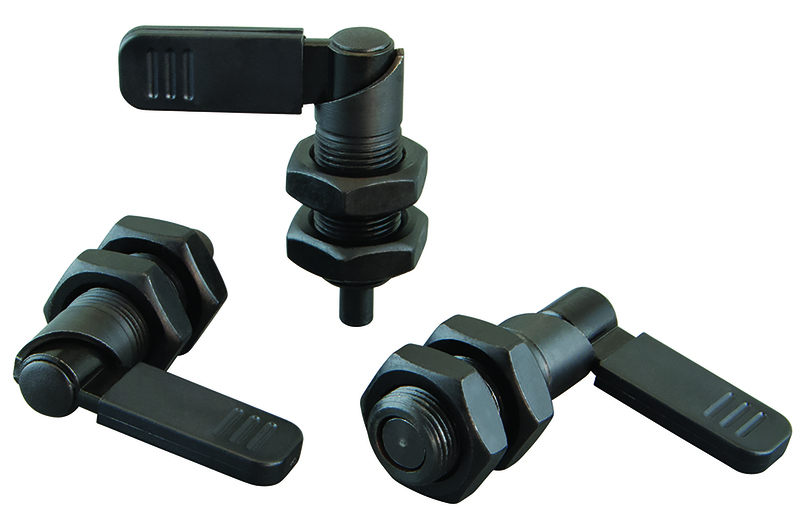 Each mount incorporates a feature allowing the plunger thread to be gripped securely without the need for lock nuts and without damaging the plunger body thread, thus making future adjustment easier. 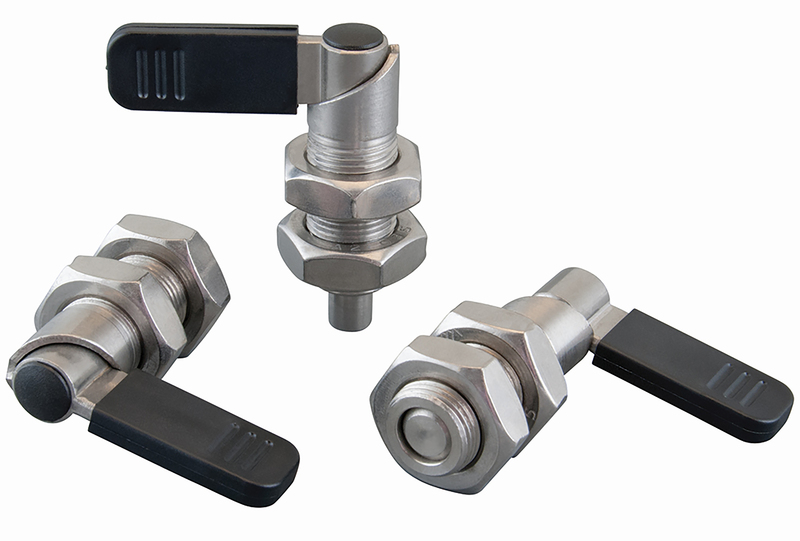 Cam index plungers are usually operated manually and individually, but they could be adapted and incorporated into automated systems, providing an alternative to solenoid plungers. WDS’s catalogue, viewable at www.wdsltd.co.uk, includes a huge range of index plungers, including cam operated and other sorts. The website can also be used to order plungers, with overnight dispatch normally being available as the standard option. Two- and three-dimensional CAD drawings can be downloaded from the site and full technical details are available. Technical support is available via email or a telephone helpline. Image 1: There are many types of index plungers, including spring-loaded, screw-action and push-type, with cam-operated plungers being noted for their ease of operation. Image 2: WDS can supply cam action indexing plungers in a wide range of sizes and variants.